Welcome to our Birthday Party Section, choose from our range of party gifts for boys and girls. 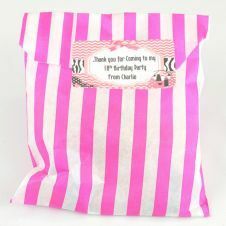 All our products are made fresh so please allow a day to make products when purchasing and contact us about what you would like on your personalised tag for the Belgian Chocolate Numbered Lollipop and the Pic N Mix bags. Happy Shopping! !